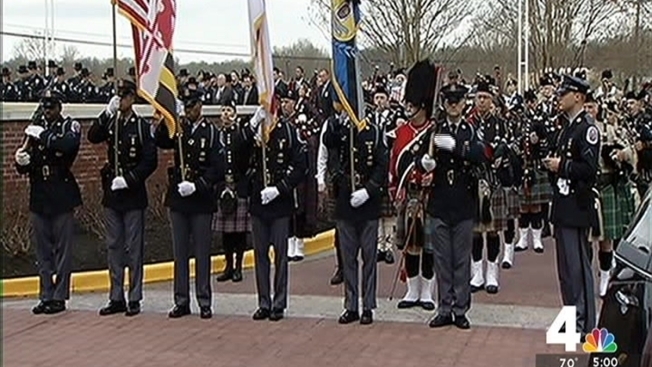 Thousands of family, friends and law enforcement officers gathered Friday to remember the Prince George's County police officer shot and killed this month in a shootout at a police station. Honor guards lined the road Friday as motorcycle units escorted the body of Officer Jacai Colson to First Baptist Church of Glenarden in Upper Marlboro, Maryland. “It’s a grim reminder every time we come to one of these things that this is what we face every day,” D.C. Police Chief Cathy Lanier said. 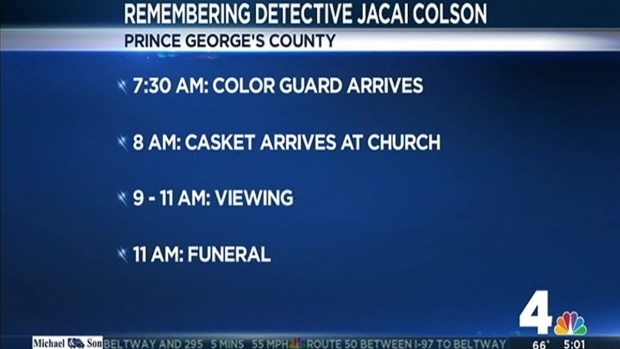 Colson was killed March 13 by one of his fellow officers after a man began firing at a police station in Landover. A wounded suspect, Michael Ford, 22, was arrested and faces more than two dozen charges including second-degree murder. He was trying to commit suicide by police officer, police said. His two brothers also are in custody facing several charges. Family, friends and law enforcement officers will gather Friday to remember a Prince George's County police officer who was shot and killed in a shootout at a police station. News4's Molette Green has more on Friday's service. Colson, a four-year veteran of the police department, grew up in Boothwyn, Pennsylvania, and is survived by his parents and younger brother, police said. He graduated from Chichester High School in 2005 and Randolph-Macon College in 2009. Friday's funeral was open to the public. A procession at 12:30 p.m. briefly closed Powder Mill Road, Baltimore-Washington Parkway, Interstate 495 southbound, Central Avenue and Largo Road.